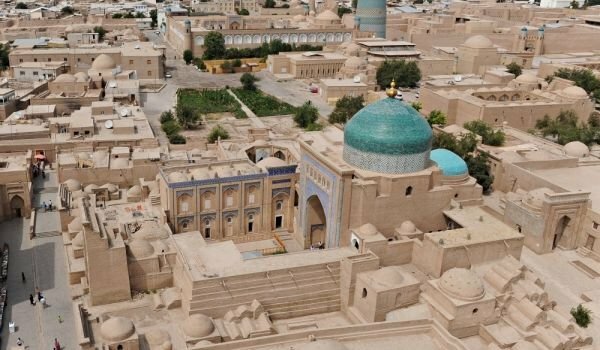 Samarkand is the oldest and most important city in Uzbekistan and is generally one of the most fundamental in the history of the entire Asian continent. The historic settlement lies in the Zarafshanskata Valley, Samarkand is the center of the area and second largest city in Uzbekistan. From its long history of many centuries the city has preserved many cultural and architectural monuments, with the result that today Samarkand is a World Heritage Site of UNESCO’s. This place really has a unique mixed multinational atmosphere, which has an overlay in the attitudes, customs, local and overall appearance of the buildings. 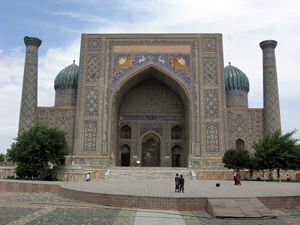 Samarkand was called "the pearl of the Muslim world" and "Rome of the East". Samarkand originated around 2000 BC. In those ancient times, the city was known primarily as Afrosiab, and the Greeks called it Maracanda, old town is also known as Afrosiab, and Maracanda by the Greeks. In the early years, the settlement was the capital of the Persian province of Sogdiana, but in 329 BC it was conquered by the powerful army of Alexander the Great. Thanks to its strategic location, Samarkand gained fortune and prospered through trade routes passing here. The site was essential for the so-called. Silk Road, and an important link between China and the Mediterranean region. In the early eighth century it was conquered by the Arabs and soon became an important center of Muslim culture. In 1220 the historic village was almost completely destroyed by the Mongol ruler Genghis Khan. In 1369 Samarkand became the capital of the then Central Asian empire, led by Timor. Samarkand was experiencing a golden age and became the architectural pearl of Central Asia. Palaces, astronomical observatories and Islamic colleges were built by Timor and his successors. In early 1500, the nomadic Uzbeks attacked Samarkand. Some of the sights that can be seen in Samarkand is Rejistan. Located downtown, this historic monument is surrounded by three universities, it is distinguished by its unique colorful mosaic exterior. Their madrassas are considered some of the most beautiful preserved monuments of Islam. Quite intriguing is also the Bobi Hanum mosque, which was restored in the 10th century after a powerful earthquake. This temple is named after the beloved of Timur, and its dome is the largest in the entire Muslim world. The massive entrance gates are high as 35 meters and in front of them is a bustling city market that offers many fruits, vegetables and spices.